A couple Sundays ago, I wrote about some little tomato plants that the greeter was giving away at the Walmart Garden Center. Well, those three little guys are still doing well. Every morning I give them their little drink of water and then put them in the eastern back porch window to catch the morning sun. Later in the afternoon, I shift them over to the western window for the rest of the evening. They’re wanting more sun, though. I can tell. They actually lean into it. They’ve grown a bit since I brought them home that day. They’re getting a bit too big for their little 12oz cups, I think. Earlier today, while shopping at Walmart again, I stopped in the Garden Center and bought some potting soil and three 8′ buckets. When I got home, I transplanted those little guys into their new pots. They’re happier now. I staked them and watered them and set them on my outside back patio. They’re all set and waiting for the morning sun to shine on them. This is their first night out alone. I’ve been checking on them regularly, though. With any luck at all, I should have some yummy maters in just a few months. I am not much on gardening, but I figured what the hell? I’ll give it a try. I didn’t even eat tomatoes or salad for the first 49 years of my life, but that’s a whole ‘nother story. My biker pals would laugh if they read this. HA! Posted by V. T. Eric Layton on 26 March 2011 in Around the Home and tagged gardening, potting soil, tomatoes, Walmart. Hehehe, Gardening on a trike or is that a bike? Even big bad bikers have to eat, better it be a fresh tasty tomato than a heart attack burger from Sam’s bar and grill. But, one can not live on tomato’s alone, you must sometimes have a bit of fried moo cow also. 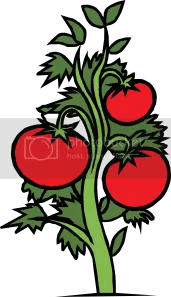 Have Fun with your almost free tomato garden. Cool! I like your website. I’ll be checking it out more in a bit. Thanks for reading and commenting. Awesome! You might need to water them more frequently then you did inside, especially in pots like that on the patio in the sunshine which they will just love! But they should do great there as long as the critters don’t mess with them and they get enough water! Eric, you said you bought “buckets”. Do they have holes in the bottom for drainage? No drainage will rot the roots. Also, be careful of watering for a while–you’ve increased the size of their pots a great deal and there’ll be a lot of potting medium that will stay wet without a rootball to take up the moisture.